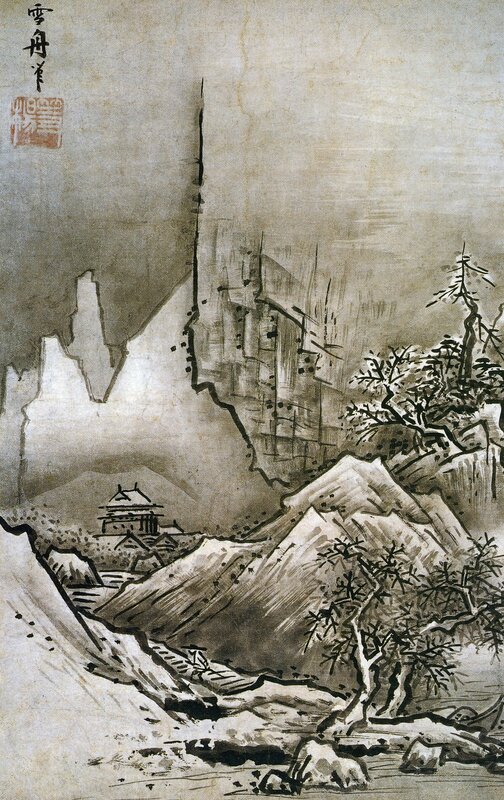 Sesshu Toyo is the name of one of the most famous painters of the old Japan, although that is not his real name. It is known that he is born in the year 1420 in the samurai Oda family, but his original first name is unknown. He gets the name of Toyo in 1431 when, under the pressure of his father, is enrolled as a student in the zen rinzai temple of Hofuku-ji. There he learns the use of the ink and wash painting through the Japanese calligraphy, along with instruction on religion. However, sayings say that Sesshu was undisciplined and, instead of studying, he spent the time drawing. Approximately in the year 1440, the painter moves to Kyoto (then, the capital city of Japan) and studies in the temple Shokoku-ki, under master Tensho Shubun, one of the most recognized artist of that time. The style of his master was inspired by the Chinese Song dynasty and Sesshu, loyal apprentice copies him. At that time, Sesshu (“snow boat”) begins to call himself that way and travels to China in order to learn more of their painting, receiving even commissions from the imperial palace in Beijing. Winter landscape, along with Autumn landscape, were painter possibly in 1486. Today’s work is a great example of the sumi-e Japanese painting, that only use wash ink. Despite being monochromatic, the different scales of grays give the canvas at dreamy atmosphere, slightly mysterious. Here, it doesn’t matter the simplicity of shapes of constructions, trees and the person; or the evident incoherence of the sizes between the trees and a mountain: this kind of painting just want to takes us to another frame of mind… of self-awareness, peace and welfare. ~ by Álvaro Mazzino on November 4, 2010. I’ve talked about Chanel Hardware before. But here is the exciting new thing I’ve learned for choosing the right metal. It’s your skin tone and what looks better with it. This entry was posted on November 4, 2010 at 10:18 and is filed under Uncategorized.You can follow any responses to this entry through the RSS 2.0 feed.You can leave a response, or trackback from your own site.